HONOMŪ, Hawaiʻi - One man says the Subsistence Agricultural Homesteads should be made available to those beneficiaries impacted by the eruption of Kīlauea. (BIVN) – A plan to make 766 acres of land in Honomū available for a Subsistence Agricultural Homestead Community by the Department of Hawaiian Home Lands is examined in a draft environmental assessment, or EA. The document, which anticipates a finding of no significant impact, favors Alternative Plan B as the way forward. Alternative B is the preferred alternative for DHHL. The different alternatives were explained during a March 2018 meeting held in the Honomū Gym. The primary land use of this project is subsistence agriculture. As previously mentioned, subsistence agricultural lots are no more than three acres in size and allow for, but do not require, a residence. The planning team determined that for Honomū, the size of each subsistence agricultural lot could range from one to three acres. There is no minimum size for DHHL subsistence agricultural lots, but a minimum lot size of one-acre was determined based on the rural nature of the existing community and feedback from agricultural applicants at the beneficiary meeting in October 2017, current farmers (including those farming on DHHL agricultural lots), and University of Hawai?i College of Tropical Agriculture and Human Resources (CTAHR) agricultural extension agents. All sources confirmed that one-acre lots are sufficient to support subsistence agriculture, allowing enough space for agricultural plots, a house, an on-site wastewater disposal system, a water catchment tank, and stormwater detention. The actual mix of lot sizes will depend on the existing topography of the site and DHHL beneficiary preference, but the maximum number of lots proposed is 375. This assumes that all lots are one-acre in size and that no additional land is needed for roads or drainage features. The number of lots could be less if two and three acre lots are also offered or if additional land is needed for roads and drainage features during design. To be conservative, project impacts will be assessed based on the maximum lot size of 375. Based on other DHHL agricultural homesteads, DHHL expects no more than 50% of lessees to reside on their lots. Based on this 50% settlement rate, 188 lessees are expected to build a house on their lot (50% of a maximum of 375 lots). The average household size for DHHL beneficiaries in East Hawaiʻi is 3.291 persons (U.S. Census Bureau 2008-2012 American Community Survey). Therefore, the residential population for the Project is estimated at 188 houses X 3.291 persons per household = 619 people when the Project is fully completed and settled. Crops grown on subsistence agricultural homestead lots are expected to provide food to be consumed in the home or provide supplemental household income. The subsistence agriculture designation was created to provide agricultural lands that are more manageable than the large lots previously offered under the General Agriculture program, which had resulted in few lessees cultivating the land. DHHL pays for a dedicated CTAHR agent to provide technical services to DHHL beneficiaries on Hawai?i Island in an effort to improve the success of agricultural lessees. Subsistence agriculture lessees are required to either (1) actively cultivate their land or (2) reside and actively cultivate their land within three years of receiving their lease. Applicants must live on Hawaiʻi Island. Those applicants not living on Hawai?i Island need to relocate there within three years of receiving their lease. In order to maintain the agricultural character of these lands, infrastructure in these agricultural homestead communities will be rural in nature. For more on the infrastructure standards that will be implemented, please see the discussion in Section 1.4. The supplemental agriculture land use designation is meant for large-lot agriculture and is intended to provide opportunities for agricultural production for supplemental income and home use. The Supplemental Agriculture area will provide the Project’s successful subsistence farming lessees with opportunities for additional acreage to grow their crops. DHHL designates commercial lands as those that are suitable for retail, business, and commercial activities. A portion of the Project is adjacent to ʻAkaka Falls State Park, which provides an opportunity for complementary land uses. The Department of Land and Natural Resources (DLNR) Division of State Parks (DSP) has shown interest in expanding its existing parking lot, which regularly overflows. As the State charges an entry fee for non-Hawaiʻi residents, there is an opportunity to generate some revenue either through parking fees or through a lease to DSP. Specific commercial uses will be determined as opportunities arise but will be complementary to the uses in this area. Uses that may be considered include a scenic lookout toward Kahuna Falls, snack shop, souvenir shop, or education kiosk. Community use areas are common areas for shared homestead uses and facilities and may include space for parks, recreation, cultural activities, community-based economic development, utilities, and other facilities and amenities. Specific community uses will be determined by the homestead community. Areas requiring special attention because of unusual opportunities and/or constraints are designated as special districts. Two types of special districts are identified in the Project: project buffers and stormwater management. Project buffers of approximately 100 feet wide are proposed along ʻAkaka Falls Road as both a physical and visual barrier between the roadway and the Project. This buffer may be either open space or include some type of vegetation, possibly a homestead community-owned and/or managed orchard. Such spaces could be used as training sites for agricultural best practices. Honomū experiences high average annual rainfall. In working toward minimizing impacts from runoff and erosion on makai properties, the Project has designated a special district area in the makai portion of the southern parcel for stormwater management, should it be needed. Environmentally sensitive areas are designated as conservation, limiting uses. 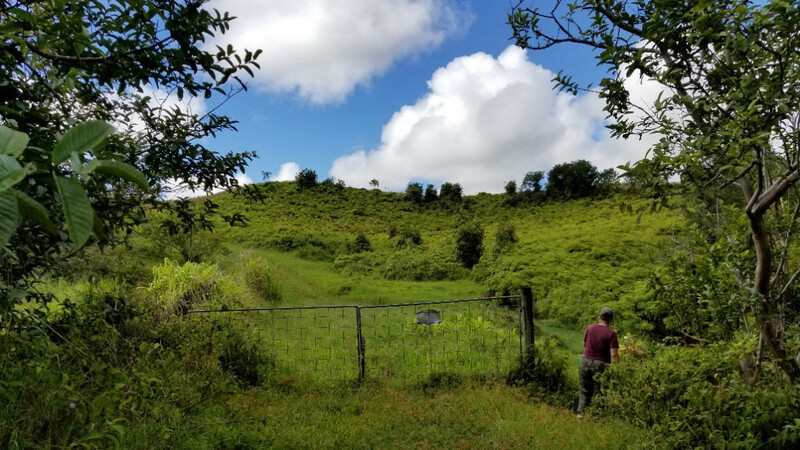 The Project identified areas with steep slopes, the potential for biological habitat restoration, and challenges for development as conservation and are meant to be kept undeveloped as drainageway buffers, biological resource protection, and open space. Infrastructure for this project will be designed to provide for the health and safety of residents but be appropriate for a rural area. DHHL will coordinate with the State of Hawai?i Department of Transportation (HDOT) to provide access to the Project off of ʻAkaka Falls Road. Internal roads will include one 10-foot wide travel lane and one 4-foot wide grassed swale and shoulder in each direction. These standards will not allow the roads to be dedicated to the County at this time; therefore, DHHL will be responsible for maintenance. However, DHHL will designate a total road right-of-way of 50-feet wide to allow for possible road upgrades that could allow for future dedication to the County. 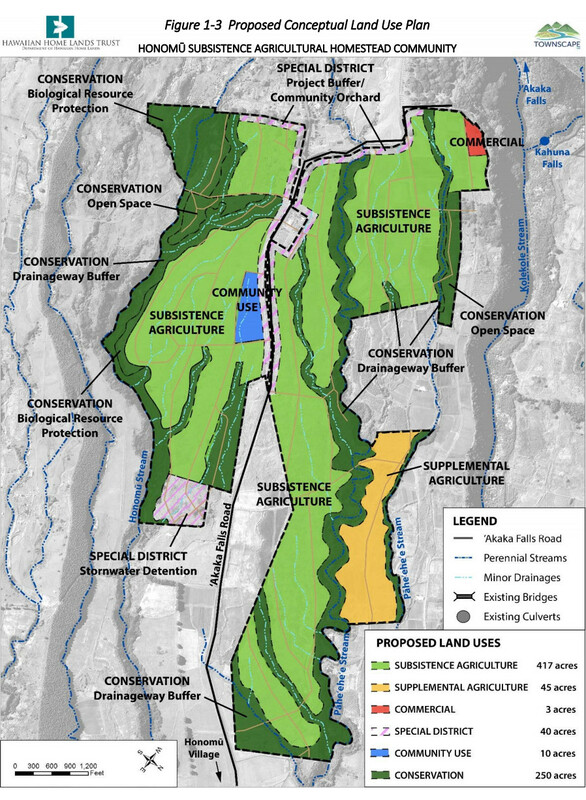 The existing topography will only be altered to the extent necessary for the safe implementation of proposed land uses and will adhere to County of Hawaiʻi grading permit requirements. DHHL is also coordinating with the South Hilo Soil and Water Conservation District to develop a Master Drainage Plan to manage runoff and erosion. Lessees will also be expected to maintain on-site stormwater retention areas on each subsistence agricultural lot. Streams and gulches will be designated as conservation lands to maintain existing drainage patterns and retention areas have been identified, if needed. Water will be provided via catchment system to be constructed by lessees. The high rainfall in Honomū is expected to provide most, if not all, of the irrigation needs for subsistence agriculture cultivation. Catchment tanks will be necessary for those lessees who choose to build a house on their lot or want to provide for back-up or supplemental irrigation water for their crops. The average cost for materials to construct a 12,000-gallon water catchment system is $4,000; for a 10,000-gallon water catchment system is $3,500; and for a 2,000-gallon water catchment system is $1,500. The actual size of each water catchment system will depend on the use intended by each lessee (residential, crop irrigation). For irrigation purposes, water demand will depend upon the type of crop grown, the land area cultivated, and the type of irrigation method. These types of details can be developed between the lessee and the CTAHR agent assisting them. Wastewater disposal will be the responsibility of each subsistence agriculture lessee. Only subsistence agricultural lots that have a residence are expected to need wastewater disposal and not every lessee is expected to build a house. DHHL will coordinate with the State Department of Health (DOH) to determine the appropriate wastewater requirements for the project and will provide guidance to lessees that wish to construct wastewater disposal systems. The most common type of Individual Wastewater System (IWS) is a septic system. The average cost for materials and installation of an IWS to serve a 3-bedroom residential home is $8,000. Solid waste disposal will be the responsibility of each lessee. Green waste recycling will be encouraged. Electrical power will be provided by DHHL via overhead electrical lines along internal roads. Communications, such as telephone and internet service, will be the responsibility of each lessee. Implementation of Phase I is expected to begin in early 2019 and will include about 15 subsistence agriculture lots. Phase I is purposely designed to be small to work through the process of designing for this particular site. Any lessons learned from this Phase I will inform the design and implementation of subsequent phases. The number, timing, and size of each phase will depend upon engineering master planning, permits and approvals, construction financing, and infrastructure development, but DHHL will work toward awarding the final increment of leases by 2032. Meanwhile, one beneficiary sees opportunity for disaster relief in Honomū. Craig “Bo” Kahui – the executive director of the LaʻiʻŌpua 2020 project in Kona, told the Hawaiian Homes Commission during its September 24 meeting in Hilo that the Honomū lands could be used to help beneficiaries impacted by the eruption of Kilauea.